Joseph Low, “ISIS in the Pacific: Assessing terrorism in Southeast Asia and the threat to the homeland,” Brookings Institute, April 27, 2016, http://www.brookings.edu/research/testimony/2016/04/27-isis-southeast-asia-liow. He was arrested in March 2015 and charged with terrorism offenses. He is currently serving a five-year sentence.“Indonesians jailed 3-5 years for ISIS support,” Straits Times, February 10, 2016, http://www.straitstimes.com/asia/indonesians-jailed-3-5-years-for-isis-support; “Security Council ISIL (Da’esh) and Al-Qaida Sanctions Committee Adds Five Entries to Its Sanctions List,” United Nations, April 20, 2016, http://www.un.org/press/en/2016/sc12332.doc.htm. “Security Council ISIL (Da’esh) and Al-Qaida Sanctions Committee Adds Five Entries to Its Sanctions List,” United Nations, April 20, 2016, http://www.un.org/press/en/2016/sc12332.doc.htm. While in custody, Febriwansyah confessed to having known one of the culprits in the January 2016 terrorist attacks in Jakarta that killed four civilians.“Indonesians jailed 3-5 years for ISIS support,” Straits Times, February 10, 2016, http://www.straitstimes.com/asia/indonesians-jailed-3-5-years-for-isis-support. Muhammad FachryNiniek Karmini, “Indonesia tries 7 suspected militants over IS links,” Associated Press, October 12, 2015, http://bigstory.ap.org/article/782807fb5ffc4679841478cd26ab7575/indonesia-tries-7-suspected-militants-over-links. Muhammad Fachria“Security Council ISIL (Da’esh) and Al-Qaida Sanctions Committee Adds Five Entries to Its Sanctions List,” United Nations, April 20, 2016, http://www.un.org/press/en/2016/sc12332.doc.htm. Muhammad Fachri“Security Council ISIL (Da’esh) and Al-Qaida Sanctions Committee Adds Five Entries to Its Sanctions List,” United Nations, April 20, 2016, http://www.un.org/press/en/2016/sc12332.doc.htm. Tuah Febriwansyah bin Arif Hasrudin“Security Council ISIL (Da’esh) and Al-Qaida Sanctions Committee Adds Five Entries to Its Sanctions List,” United Nations, April 20, 2016, http://www.un.org/press/en/2016/sc12332.doc.htm. The U.S. Department of State designated “Tuah Febriwansyah” as a Specially Designated Global Terrorist pursuant to Executive Order 13224.“Treasury Sanctions Major Islamic State of Iraq and the Levant Leaders, Financial Figures, Facilitators, and Supporters,” U.S. Department of the Treasury, September 29, 2015, https://www.treasury.gov/press-center/press-releases/Pages/jl0188.aspx. 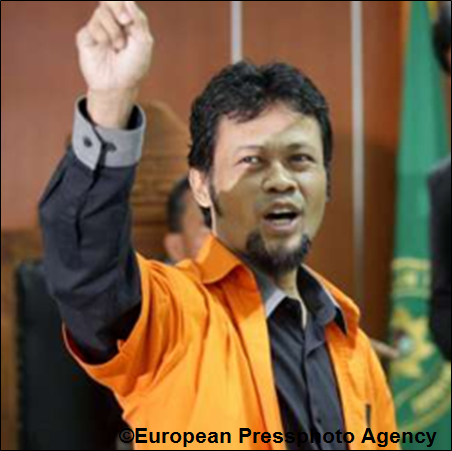 The European Union added “Tuah Febriwansyah” to its list of Natural persons.“Commission Implementing Regulation (EU) 2016/647,” EUR-Lex, April 25, 2015, http://eur-lex.europa.eu/legal-content/EN/TXT/?toc=OJ%3AL%3A2016%3A109%3ATOC&uri=uriserv%3AOJ.L_.2016.109.01.0023.01.ENG. The United Nations adds “Tuah Febriwansyah” to its ISIL (Da’esh) and Al-Qaida Sanctions List.“Security Council ISIL (Da’esh) and Al-Qaida Sanctions Committee Adds Five Entries to Its Sanctions List,” United Nations, April 20, 2016, http://www.un.org/press/en/2016/sc12332.doc.htm. Indonesian citizen Tuah Febriwansyah is a U.S.-designated ISIS propagandist, financier, and recruiter currently imprisoned in Indonesia.